There was some “political realignment” that resulted in WSU being admitted to what was referred to as “The Big Six” which included all of the major players in the PCC except the Oregon schools and Idaho. Sutherland returned to the white helmets, this time with crimson three-inch block style player numerals on each side of the shell. 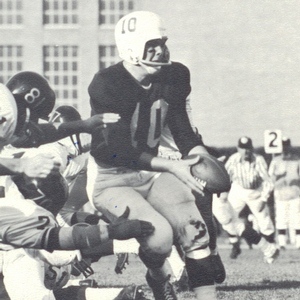 Dave Mathieson stepped up as the top rated QB in the conference, posting twelve TD passes and his main target remained Hugh Campbell who was given All Conference notice. FB George Reed was outstanding and even more outstanding in his pro career where both he and teammate Campbell were later inducted into the CFL Hall Of Fame. Improvement to 5-4-1 was welcomed but there was general dissatisfaction with the program. Not a well-known name to most fans interested in the national collegiate scene, WSU fullback George Reed came out of Renton, WA High School and was quiet, unassuming, and rather terrific. Overshadowed by Coach Jim Sutherland’s pass happy offense, Reed provided the rushing nuts and bolts and was dependable as a three year performer when asked to block, catch, or run the ball. Football genetics were on his side with brother Smith Reed who played with the Giants and he married into a football family. As one of two African Americans on the WSU team, Reed was forced to stay on the Texas Southern University campus when the squad played at Houston. Fortuitously he met Angie Levias, the sister of Jerry Levias whom he later married and thus could claim family ties to more football greatness with relatives including former pro stars Jerry Levias, and both Miller and Mel Farr having notable careers. His foster brother Clancy Williams followed George at WSU. Reed went to Canada where he is considered to be “Canada’s Jimmy Brown,” a twelve season Hall Of Fame star for the Saskatchewan Roughriders and he set numerous seasonal and career records. Utilizing out-sized muscular twenty-nine inch thighs, his 134 rushing TD’s stood for decades and while his 16,116 rushing yards record was surpassed by Walter Payton and Emmitt Smith, Reed will forever remain one of the CFL’s all time best. Numerous times named to the All CFL team and twice the league’s MVP, Reed has been successful in business, has given much time to charity fund raising, and was made a member of The Order Of Canada, the nation’s highest civilian honor. Successful as the first American and first African American to head the CFL Players’ Association, Reed did the same in his community as PTA President and the spearhead of numerous projects benefiting Special Olympics. 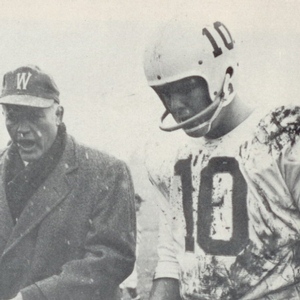 A two-time All American and NCAA pass reception leader, Hugh Campbell, “The Phantom Of The Palouse” was the perfect fit for Jim Sutherland’s pass-oriented offense. As both a quarterback and receiver at Los Gatos High School in Saratoga, California, he understood the passing game well. He caught sixty-six passes as a soph and set total reception yardage records. He completed his great career with the Voit Memorial Trophy emblematic as the outstanding football player on the Pacific Coast, and rewarded assistant coach Bob Gambold’s faith in him with career marks of 176 receptions for 2452 yards, both NCAA records at the time. Known as “Gluey Hughy” for his excellent receiving abilities, he was the MVP in a number of post-season all star games before embarking on a pro career in Canada. After five years with Sasatchewan where he played with WSU teammate George Reed, Campbell returned to the Cougars as an assistant coach but went back to Canada for a final season, in ’69 with the Roughriders. He finished his playing career with a long list of honors and then became the seven year coach of Whitworth College in Washington. He established himself as capable and innovative before moving to the head coaching position with the Edmonton Eskimos. He became a coaching legend, winning five consecutive Grey Cups and moved to the LA Express of the USFL in ’83, following that with two seasons heading the Houston Oilers. He returned to Canada as Edmonton’s GM and CEO where he remained as the head of the organization for twenty seasons. Like Reed, Campbell is a member of the CFL and State of Washington Halls Of Fame. While pushing for the winning score against Iowa in the ’63 season’s second game, the down marker was accidentally pushed ahead a down and the 14-all tie became known as “The Lost Down Game.” Even a win over Iowa would not have made much difference in the fate of the head coach. Sutherland’s 3-6-1 record matched what he had accomplished his first season in Pullman and that was enough for the decision makers. Coach “Suds” had tried to develop two platoons of two-way performers with HB Clancy Williams, George Reed’s foster brother, the big offensive gun. William Dale Ford, affectionately known as “The Whale” became a legendary multiple letter winner in football, basketball, and baseball and played well at both HB and QB while Gerry Shaw admirably filled the shoes of the departed Hugh Campbell. Unfortunately in seven of ten games, the vaunted WSU offense failed to rise above single digits and Sutherland would be removed at the end of the season.